Hospitals and health care facilities are challenged with hospital acquired infections that are proving difficult and expensive to treat. The implications for patients can be much greater, resulting in morbidity and death. Clearly the cleaning regimens now in place are not coping with the increased resistance of organisms such as methicillin resistant Staphylococcus aureus (MRSA and now evolving into VRSA), Clostridium difficile, E. coli, Salmonella sp., Streptococcus sp, and others. 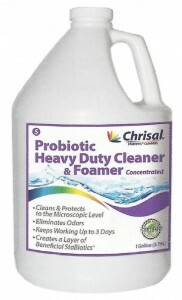 The Chrisal PIP probiotic cleaning products use specific, naturally occurring (none GMO), safe, Type 1 bacteria in combination with cleaning agents that have been approved as “Green” by Ecolabel, such as surfactants and enzymes for their mechanism of action. These Chrisal products have an efficacy that has been well demonstrated in a number of hospital studies as well as in active use over the past six years. Chrisal is currently used globally in a range of facilities from acute care hospitals and medical clinics, to long term health care facilities for the aged. Bacteria, especially pathogens, have a strong tendency to develop resistance to any substance that might be detrimental or lethal to them. This phenomenon is especially significant in the case of antibiotics and disinfectants. In order to avoid the development of resistance, none of the Chrisal PIP products has any direct biocidal action towards other organisms. Instead the mechanism of action is based on the principle of ‘competitive exclusion’, combined with an influence on the ‘quorum sensing’ communication between pathogenic organisms. Disinfectants have an unspecific biocidal action; killing both beneficial good bacteria and “bad” pathogenic micro-organisms. This destruction of the normal balance of bacteria results in a surface actually more conducive to rapid colonization (infections) in a very limited timeframe. Each disinfection procedure leaves organic matter behind that serves as protein and carbohydrate sources creating fuel to sustain the fast re-colonization of the surface. Disinfection also removes the normal beneficial bacteria that serve to hold back pathogen growth through competitive exclusion. Using these energy resources created by disinfectants, pathogens can multiply from one to a population of one million cells within 8 hours. While disinfection results in a fast reduction in the total number of micro-organisms, this effect is very short and unstable. The resistance of pathogens like MRSA to higher concentrations and frequencies of disinfectant/antibiotic applications has resulted in an increased risk to people and the environment from both the pathogens and the aggressive chemicals meant to kill them. Why Are These Problems Not Relevant To The Chrisal Probiotic PIP Products? First, the principle behind competitive exclusion is that during the cleaning procedure, a layer of beneficial bacteria is placed on the treated surface, and immediately occupies the surface with “good” bacteria. They consume all remaining food sources, leaving nothing behind for potential pathogenic invaders looking for space and food. The beneficial Chrisal PIP bacteria are much more active and out-compete all other organisms.Second, “Quorum Sensing” is an extremely fast means of communication between bacteria, using species-specific signal molecules. When the Chrisal PIP bacteria are applied to the surface, an overwhelming competition for space, food and moisture is established, along with a flood of Chrisal’s PIP signaling molecules. This immediately results in the pathogenic bacteria, informing each other through quorum sensing that conditions have become unfavorable for growth, leading to them entering a dormant phase and their subsequent removal.The third major and key advantage is that Chrisal PIP bacteria immediately start to break down the biofilm coating all surfaces. This biofilm that is created by pathogens and other bacteria serves to protect colonies of harmful bacteria, as well as hold dirt, support viruses and other problematic substances.The PIP approach has the advantage of providing a stable solution to problems with pathogens without the risk of development of substance resistance. The only demand set by this method is that the frequency of cleaning be kept constant. The 3 to 5 day duration of maximum viability of the Chrisal PIP bacteria on surfaces allows for up to several days between each cleaning, which is far more time than any other cleaning methodology. It is important to realize that the total number of micro-organisms will tend to remain the same after PIP treatment; however, what is essential to understand, is that it is the good bacteria simply replacing the bad ones. Reference letter from the Midland Medical Clinic, Fort Lauderdale, FL, January 2010. The following are published articles about the actions of live non-pathogenic bacteria on biofilm and nosocomial infections. These are not associated with Chrisal, but show that the mechanism is valid. 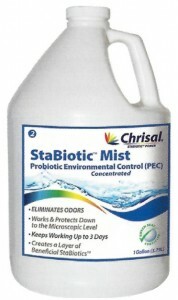 StaBiotics™ Mist (PEC) is enriched with safe probiotic bacteria, contains no chemicals, and is a safe and natural way to control odor. There are no perfumes that simply mask odors, and PIP (Probiotics-In-Progress) PEC is completely hypoallergenic. PIP Deodorizer is dispensed from a fogger, and with just a couple of applications will cause odors in carpeting, drapes, and fabrics to disappear. Safe enough to drink– no gloves or masks needed. Will not harm carpets or floors. 100% Biodegradable. Does not contain colorants or perfumes. Highly concentrated: 1 Gallon of concentrate diluted will cover 750,000 square feet, depending on degree of problems, odors or contamination. Probiotic All Purpose Cleaner is our most versatile, all-purpose, everyday cleaner enriched with safe probiotic bacteria. It can be used for numerous applications and is safe for use on delicate surfaces, porous tile surfaces, granite, stone, stainless steel, porcelain, and even windows and mirrors. It cleans and degreases quickly and thoroughly and creates a stable and healthy microbial environment. PIP All Purpose Cleaner is safe for all washable surfaces, skin and clothing, and removes unpleasant odors. It is biodegradable, non-toxic and non-flammable. Safe to handle – no gloves or masks needed. 100% Biodegradable. Highly concentrated- 100:1 dilution ratio. Note: Green Seal certified Chrisal Probiotic Green All Purpose Cleaner is now also available in scent-free and without colorants. 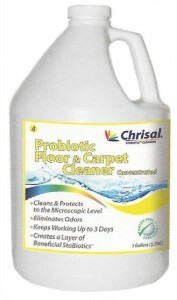 Chrisal Probiotic Floor & Carpet Cleaner is applied to all wettable floor and carpet surfaces. The concentrate is diluted in a range of 100 to 1. As is true with all Chrisal products, it is not necessary to use gloves or protective clothing. It is low foam formulated for machines use. Safe to handle– no gloves or masks needed. 100% Biodegradable. 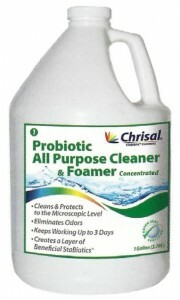 Chrisal Probiotic Heavy Duty Cleaner & Foamer is applied to the floor, walls, and equipment. The concentrate is diluted in a range of 20 to 30 to 1 depending upon the conditions in the facility, and spread with a standard foamer. One gallon of concentrate makes 100 gallons of usable product. Safe to handle– no gloves or masks needed. 100% Biodegradable. Does not contain colorants or perfumes. For more information about Chrisal Cleaning products for healthcare facilities Contact us.